The story is nothing new. Someone is at work, doing typical duties, when all of a sudden… a sneeze. However, this sneeze causes the person’s back to “go out” and severe pain resulted. It could easily have been picking up a pen off of a desk, or leaning over to throw away some trash. What happened? Most people who sustain a severe back strain cannot point to a particular traumatic episode like a car accident or a sports injury. It’s usually something ridiculously minor to the point of being embarrassing. But it’s not the minor movement that caused the back to “go out”, it’s what led up to it. 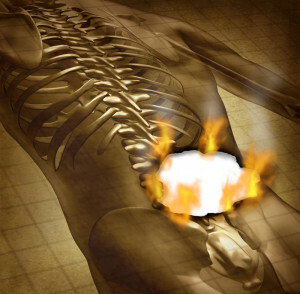 The intervertebral disc is an amazing anatomic shock absorber. A normal disc consists of 80% water and then 20% collagen and other proteins. While twisting, bending, etc – the disc absorbs the stresses by releasing water and reabsorbing it. But as humans age, the disc slowly starts to lose overall water content. That is how disc degeneration typically occurs, slowly over time. There are certain occupations which can hasten disc degeneration, such as truck driving, construction, warehouse workers, to name a few. Genetics and environmental factors play a role (such as smoking). The outer part of the disc is where sensation is felt. 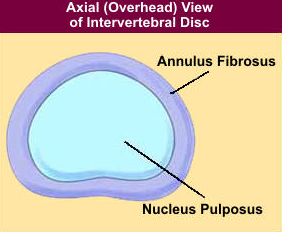 The disc has 2 parts to it, the inner part is the nucleus pulposus and has no sensation. It does not feel pain. The outer part feels pain in the annulus fibrosus and when degeneration occurs, tears can occur in this region. It can lead to severe back pain, muscle spasms, and even sciatica if a nearby nerve root gets inflamed. So when a person is at work, sneezes, and their back “goes out”, it’s the tip of an iceberg that had been growing for a long time. Degeneration accumulates over time, and eventually an actual tear occurs. The work being performed could easily have contributed to the tear in the disc along with genetics, smoking and other risk factors. Recently, I read an article about weird injuries in professional football. One was a player who sneezed, sustained a back injury, and had to miss a game. I realized, that’s not a weird injury. That’s simply the result of a degenerative disc sustaining a tear and leading to severe pain and inability to “go to work.” In that case, “going to work” was on a football field in front of 70,000 screaming fans though! If you have sustained severe back pain at work due to a seemingly minor episode, keep in mind that it’s potentially the work that led up to the injury. Call Arizona Injury Medical Associates today.